Get the TEXAS MOM shirt design for your mom today! Available by request or on location. Because our stock is constantly changing, Message us today for style and colors in stock. Show your mom some love, get her this shirt today so she looks great on mother's day! BRAT class and BRAT style! Get the OFFICIAL SPONSOR T-SHIRT for the 2017 Barrel Racing Season of BRAT. Printed on quality cotton tees perfect for spring and summer weather. This shirt features the valuable sponsors of BRAT including ADAMS TACK, Hot Shot Trading Post, 321 Action Video, Imagehounds, Texas Rodeo Trading Company, Rancho La Rosa, Jobe Hats, and Cherry Lid. Get in style and order yours today. Sizes are limited so order to reserve your size and look great on race day! Texas love is a common theme for anybody who lives in the great state. Get your LOVE shirt today and show everybody that you are Texas Proud. There needs to be more love in the world. 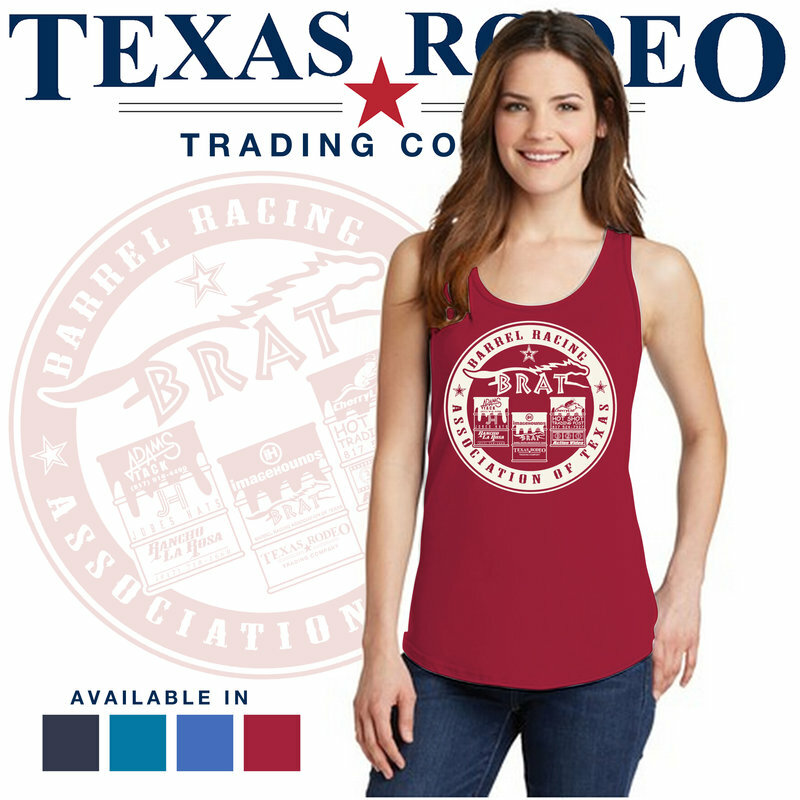 Get the OFFICIAL BRAT T-SHIRT for the 2018 Barrel Racing Season! Printed on quality cotton tees perfect for spring and summer weather. Available on location or by request. Because our stock is constantly changing, Message us today for style, sizes and colors in stock. Pecos Texas was home to the world's first rodeo held in 1883 on July 4th. Get this cool shirt design that commemorates this historical event! This is for every fan of the greatest sport on dirt! BARREL RACER t-shirt design is an instant classic and perfect for any barrel racing fan in the family. This sporty design makes a great gift. Available in a variety of colored shirts. Contact us today to get yours and look great on race day! 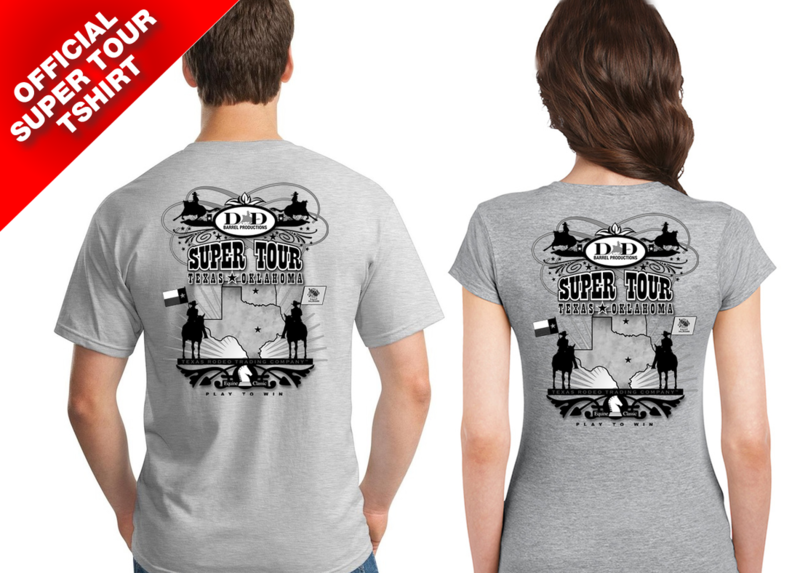 Get your SUPER TOUR t-shirt today and look great on race day! Printed on quality cotton tees are perfect for the arena in the spring and summer heat.